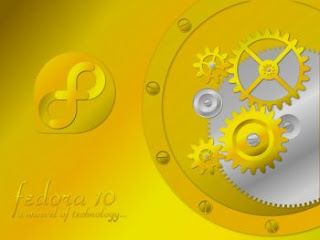 A Geek Chick's Peek at Fedora 10 "Preview"
Fedora 10, codenamed "Cambridge" is just around the corner. This upcoming version of Fedora will be released this November 25, so I'm pretty much excited about it already. First thing's first, why did I proceed on installing the preview version of Fedora 10 on Misato? --I haven't configured fully my notebook that's why I wasn't afraid to give Cambridge a test drive. And, I was also intrigued with the idea of using Plymouth for a quicker boot-up of this OS. You might be thinking what the hell is Plymouth. 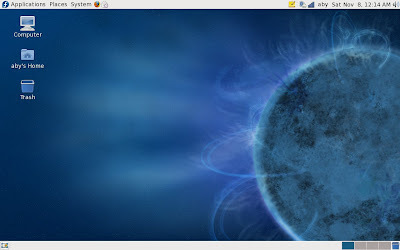 Plymouth is a program written by Fedora's developers. Its main purpose is to provide a flicker-free and seamless startup. Therefore dropping the use of RHGB. So far it didn't fail. Within 45 seconds I reached login page. In less than 15 seconds, my desktop has finished loading. This program has exceeded my expectation although I found it quite troubling for Fedora to hang up every time I turn on my notebook. Then on my second try for boot-up, it went smoothly. I just hope this doesn't persist onto the stable release. I was successful in installing Cambridge Preview, and I noticed some applications that were replaced with something else. 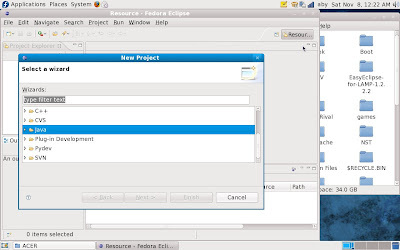 Like, Pidgin to Empathy Instant Messenger; Eclipse Ganymede (from Fedora 9) to Fedora Eclipse based on Eclipse 3.4.1. I mentioned these 2 because it was pretty obvious. And these changes are very remarkable. I also noticed OpenOffice 3.0 and Gimp 2.6, which were not included in the official list of accepted features in FedoraProject website. And both launched so fast that I didn't notice they were there already. I'm loving Linux more with this. During my exploration of Fedora 10, I didn't expect Misato would detect my wifi router. When I was using Fedora 9 "Sulphur", I had a hard time activating its WLAN device and I was supposed to use ndiswrapper to make it work. But since Cambridge did a good job, I don't see ndiswrapper crossing paths with me anytime soon. Unless, this wonderful feature will not be included in the stable release this coming 25th of November. But that won't happen, right? There are still a lot of new features that I have to see for myself. This is just to give everyone an idea of what's with the upcoming Fedora 10. 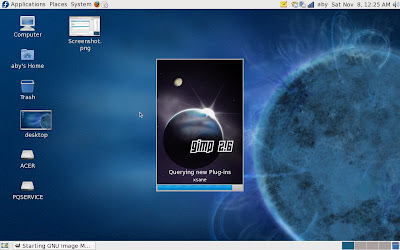 And, I can say that this is a Linux distro worth waiting for. Being a Fedora user, I am pretty excited on what it can do and what I can do with it for the coming days/months or even years. on my Presario V6000 notebook. I've just bought a new 320Gb drive for it, and want to play around. I do hope Fedora 10 will provide you a solution for this. 1 week left..
And here in lies the problem with "early previews": they are slim on details. From the screen snapshot it comes up in GNOME... which is fine if you love GNOME, but not so fine if you use KDE. So far all I have seen in "reviews" of Fedora 10 is GNOME centric, what about reviews using that sad thing called KDE 4.x ?!? Indeed how does one make KDE the default GUI?!? Me?!? I'm still using Fedora 8 because Fedora 9 is such a piece of *%@*. Truthfully my expectations of Fedora 10 are more of the same as Fedora 9 -- that's not a very high bar folks. I have grown to detest Fedora and its leadership that uses the Fedora community as test subjects for RHEL. It is not that Fedora has users in mind so much as they don't care about users, because if they *DID* care they would include KDE 3.5.10 and its necessary libs as well as KDE 4.x which is still more-or-less still not ready for prime time. Me??? I'm simply staring to think that the best thing to do is switch to CentOS and allow fools to bleed and die for Red Hat. Fedora?!? Too much bleeding stuff and not enough stability. That's what Fedora is all about! New bleeding edge test-drive stuff! Fedora is more about "Look Ma, watch me jump this cliff!" It's all about demonstrating limits and pushing borders, it's about presenting ideas as to where to go next, what envelope to push into, how well is it working, etc... .
You want great software that's going to work rock solid all the time then you should be driving a different distro. Debian Lenny, Mepis, Kubuntu, PCLinux are all more solid with extensive repos! I appreciate the comments here, but it sort of took the wind out of my sails regarding Fedora 10. I'm running openSuSE 11.0, and I think "that jumping of a cliff" might also be said here. But, it works great for me. Hey, come on lets give this a try. At one point I dropped SuSE, UBUNTU, Linux Mint. But, they all get better as distros, don't they? Linux does rock - heck there are more, and more games now. I have been entertaining two lovers in my linux dance. OpenSuSE and Fedora. I have been with both from the beginning and with each and every release I dither from one to the other and back again. In my humble opinion there are very few differences between them, mainly just what is pre-built for one may not be for the other, and also color schemes. I find that over time BOTH have addressed issues such as wifi support (for both broadcom and intel cards) and software compatibility, and even streamlining startup and running applications. Though I have not had the chance myself to play with EITHER F10 or OS11.1 Beta I know that BOTH have Live variants... In the past I have used these variants as a simple means of testing to see if my hardware will or will not work. I find that If I run a live disk and my Wifi works "OOB" then when it comes time to actually install to the HDD... it will typically JUST WORK. conversely if things don't work on the live installer, this does not mean it will not work in the full release... it simply means I will need to do some research on it first. I recommend everyone tempted to look over any new linux distro, look into the live disks. make sure it all works. if so, GO FOR IT! but as always, make sure you have a backup first... just in case.